You Can Call Him Larry ... Or Maybe Neil. Sometimes you meet the most interesting people in the most unlikely places. 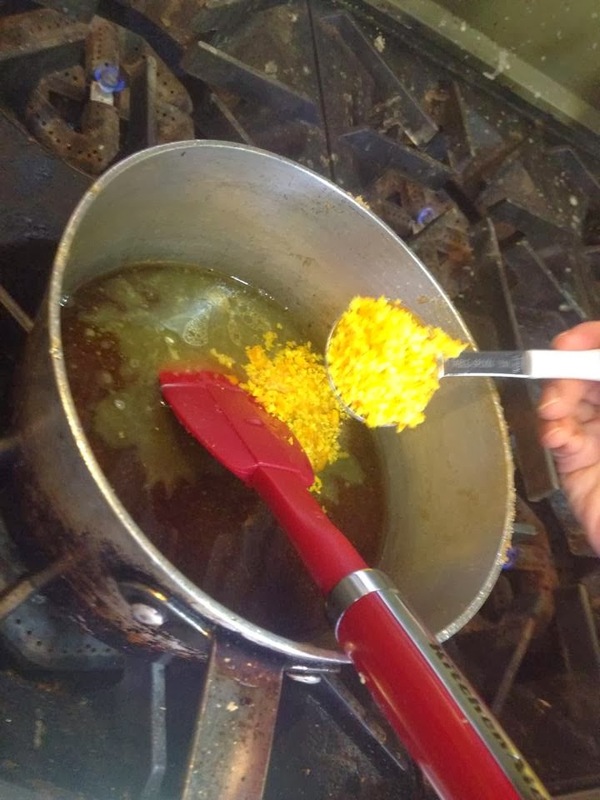 A few years ago, I was employed as a cook in a local long term care facility, a job that I very much enjoyed but didn't offer a lot of culinary freedom, and that is one of the reasons that one of my trainee cooks only stayed a handful of days. The other reason was that he was also a very authentic Neil Young tribute artist who had just been given the chance to open his own restaurant. Lawrence Christopher, (you can call him Larry), was working part time as a chef in a small eatery located at 41 Maple St. and looking for some extra work when I first met him. He was friendly, talented and easy going. Then he was gone. His employer decided to give up their business and asked Larry if he would like to buy it. He jumped at the chance and has never looked back. It has been 4 years now since Larry opened his dream business, the TLC Bistro. He hasn’t had a single vacation in that time, but Larry is okay with that. The TLC is his baby. I asked him about the meaning behind the name. Is it The Larry Christopher Bistro? Close, but the T is actually for his wife, and business partner and book keeper, Teresa. 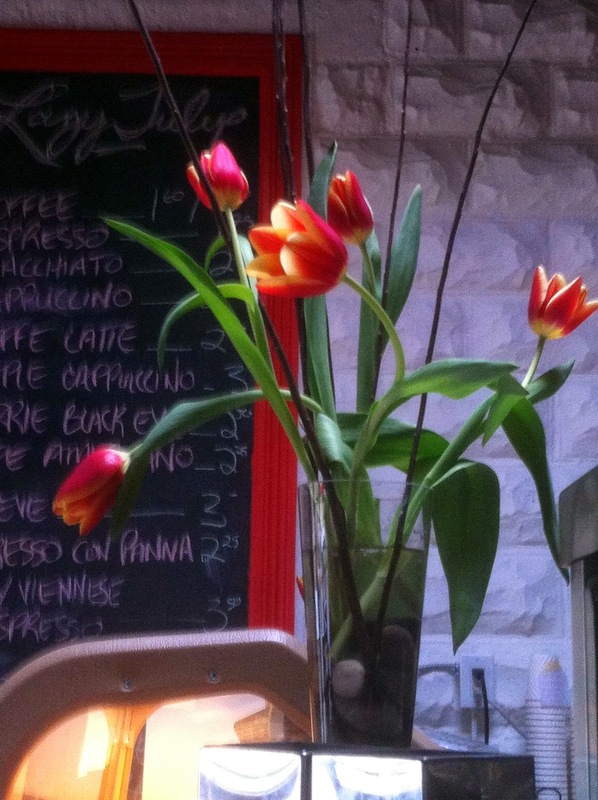 Or really, it can be anything you want it to be, such as The Little Café, as some have suggested. I have been meaning to drop in ever since Larry opened the place. Several of my nearly grown kids are self taught musicians and I thought the Thursday open mic nights would be fun, but we simply never got around to it. Then recently, a writer friend asked me if there was any place I would like to try for lunch some day. Aha, the TLC Bistro! Perfect. I arrived just before 11 on a sunny Thursday morning and popped inside and up the few stairs into the main dining area. Larry was all alone and working on some food preparation at the counter. I reminded him of his brief stint working with me in the nursing home kitchen and then began to quiz him about his new venture at the TLC Bistro. He seems to be in his element here, surrounded by a vast collection of music related memorabilia, obviously years in the gathering. Neil Young, Bruce Cockburn, Gordon Lightfoot, and Ian and Sylvia portraits crowd the walls. Musical instruments sit in a corner waiting to be used. And the menu is of his own making. At first, I sat along the front counter on one of the tall stools. A great place for people watching. Also a good place to keep an eye out for my lunch date. When Janis arrived, we moved to a central table and took a peek at the menu fare, which was simple, familiar and very bistro-esque. Sandwiches, salads, soups or combinations of the three, omelets, quesadillas and pierogis. Finish with home baking - banana bread, Nanaimo bars and butter tarts. Have an organic coffee or maybe have a beer or glass of wine on the back patio. "What's the soup today, Larry?" Cream of broccoli. Mmmm that sounds nice. I ordered that along with a salmon salad sandwich on whole wheat. How I love a good sandwich. I always feel somewhat guilty at a funeral because part way through the service I start thinking about those delicious little sandwich corners that they always serve at the reception afterwards. Why are they so good? Janis ordered the soup too, and a ham and cheese sandwich. Our lunches were divine. 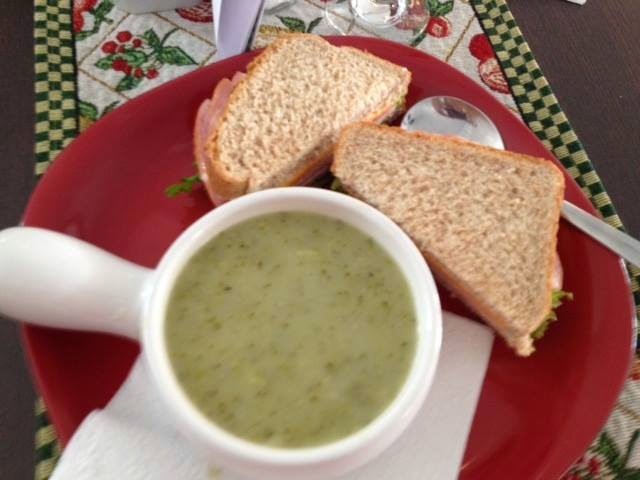 Thickly piled fillings on the softest of breads and a bowl of steaming and creamy soup. It felt a lot like having lunch at your best friend's house after school, so homey and comforting. I'm not sure how many places around serve a lunch like this. It was really delightful. I would have liked to have seen some musical performance, but no one stepped up to the mic that day. Most likely it was a bit too early. Larry said that if he wasn't busy, he would entertain us himself, but other customers came in and Larry never had a free moment to let his inner Neil Young out for us. Actually, Larry has an outer Neil Young too. He keeps his hair and sideburns in character all the time, likely because he performs his tribute show periodically at other venues too. Most of my family has been away in our birthplace, Scotland, this summer. I have been home and actually spending quite a bit of time writing travel articles about Argyll, my particular part of that beautiful land, for an about to launch website called Treksavvy. 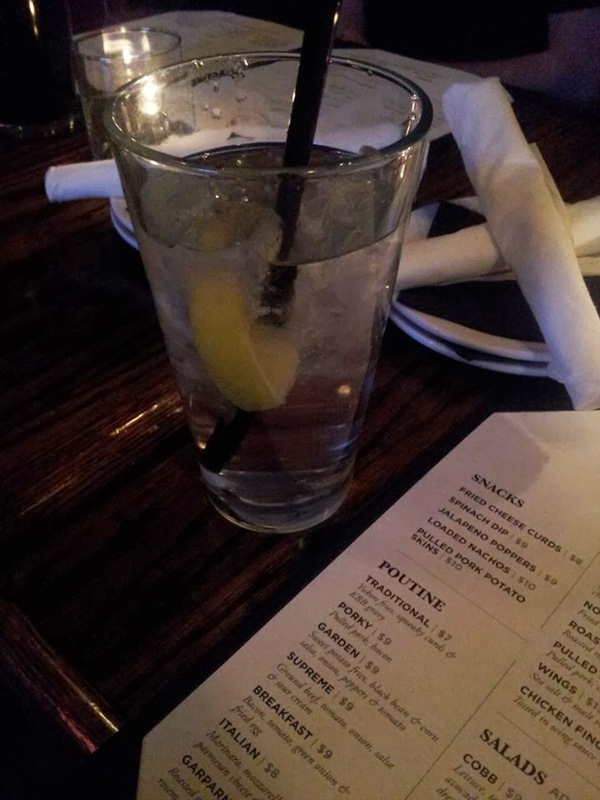 So I was more than due for a wee taste of home when I dropped into the Local Gastropub with my husband and son. We arrived just before 5:00 pm on a warm summery day, expecting to find a Friday crowd taking up every table, but we were just ahead of the rush it seems and had no trouble finding a cosy booth for three. The windows were flung open to allow the breeze in, and from our booth we could see the more colourful Barrie-ites pass by on the sidewalk. The Gastropub prides itself on its wide selection of local craft beers so my husband ordered a glass of the very light sounding Flying Monkeys Anti Gravity beer. Produced just down the street, you can't get much more local than that! The Local Gastropub has a neat, eclectic menu. It's an offering of all things fresh, local, fun, flavourful with a few tastes of the auld country tossed in and given a Gastropub twist. Where else can you get haggis lollipops with orange marmalade bbq sauce or an ecclefechan butter tart mess? 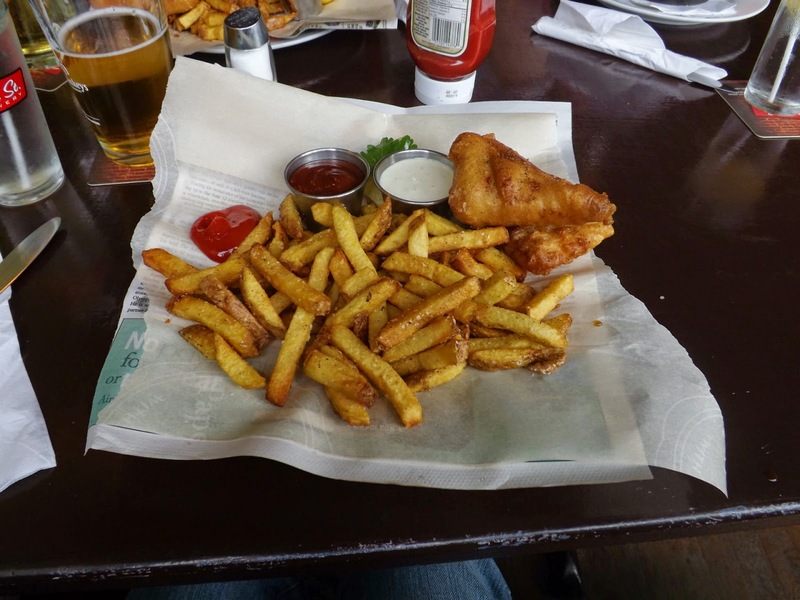 Other more familiar faves with expat Scots are cod and chips with house made spicy ketchup and tartar sauce, or the ploughman's salad (sometimes known as a shepherd's lunch in Scotland). My husband and I ordered the cod and chips. 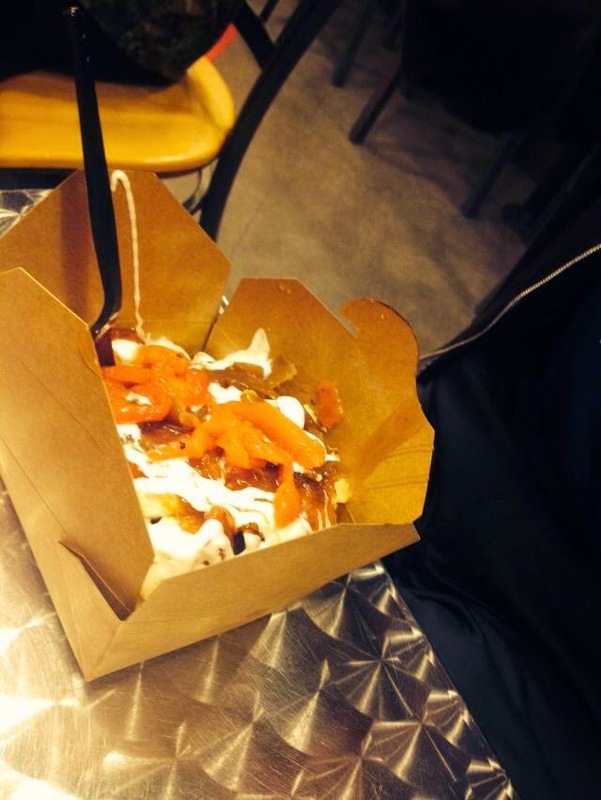 Our son opted for the plainest poutine on the menu. 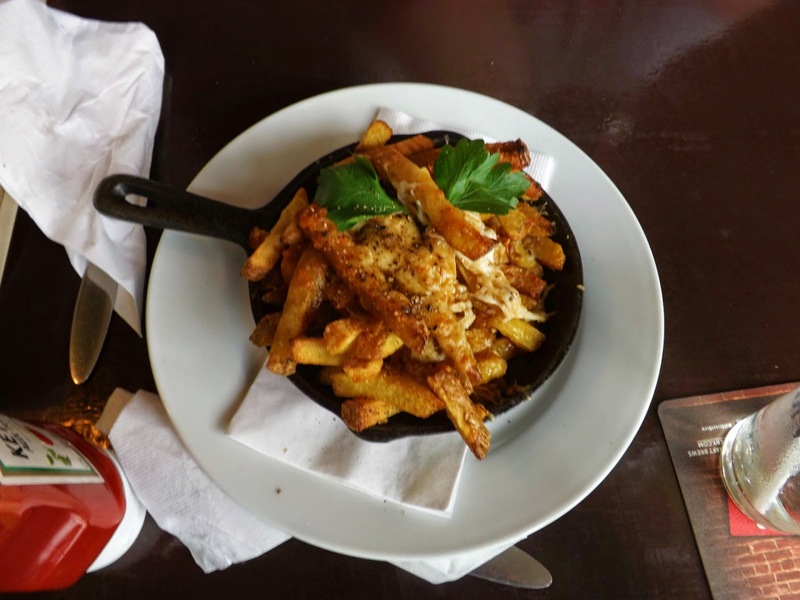 The poutine arrived in a very hot little cast iron skillet. It was topped with asiago cheese, a neat variation, and piping gravy. 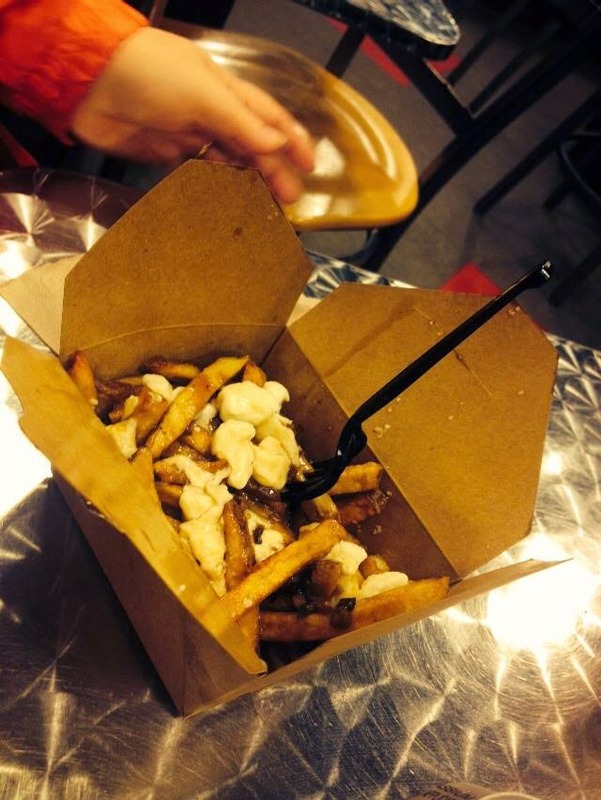 The fries were golden and crispy, and the kid enjoyed the unusual poutine with the almost parmesan-y flavour - it all disappeared anyway! Our fish and chips was presented almost traditionally styled - there was a newspaper below, but perhaps health reasons dictate that a food safe liner be placed on top of that. Too bad. How I love a takeway fish supper from a real chippy wrapped in newspaper! The steam from the hot food gets trapped and everything goes just a little bit mushy. That may sound awful to the uninitiated, but it's a good memory for me. The Local's cod and chips was very good, I must say. The batter was quite light and crisp. The fish was nice and the tartar sauce was the perfect accompaniment. The spicy ketchup wasn't overly hot at all, in fact I'm sure I detected a sweetness in it. Molasses? Honey? I should have asked. Great fresh cut fries. Our server offered us dessert and we almost never order any. But four simple words reeled us in - deep fried Mars Bar. In our most recent travels in Scotland, our son was on a mission to try this legendary confection, but somehow it never happened. What is it about the Scots and deep frying? I recall my first trip back after our immigration to Canada. I was 17 years old and we stopped for lunch in a small west coast fishing village. 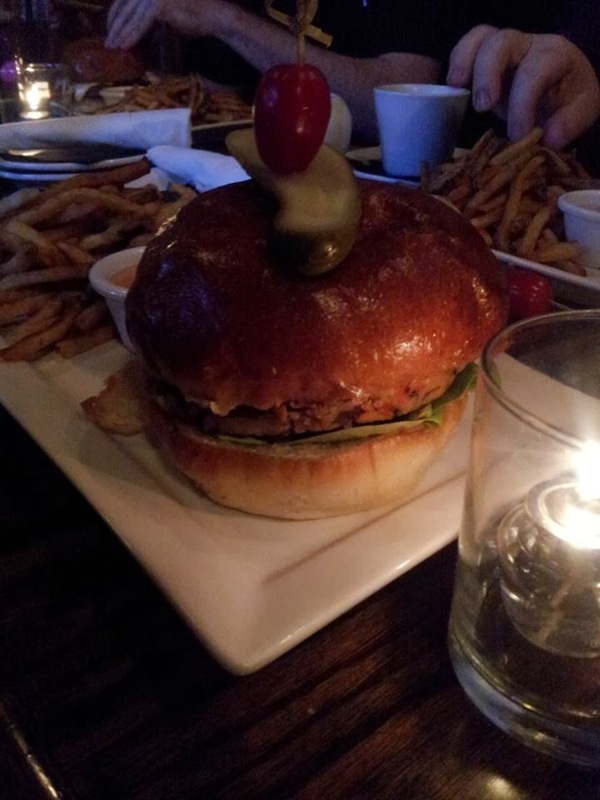 I was looking for something sort of Canadian to eat and ordered a hamburger. Well, didn't the darn thing come battered and deep fried! It wouldn't have been so bad if the frying oil didn't taste strongly of all the fish they mostly fried there. 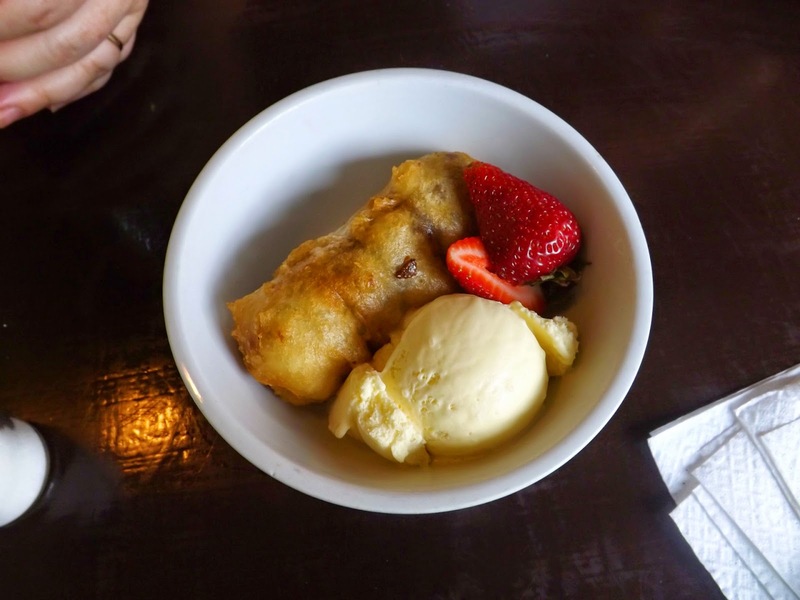 I am happy to report that the deep fried Mars Bar at the Local Gastropub was nothing like that culinary disappointment of 1981, and was an absolute dream. Inside the (not fishy!) batter was the creamiest melted chocolate bar ever, served with a dollop of vanilla ice cream and garnished with a fresh strawberry. Mmmmmm. Anne and I were great friends in high school, years ago. I won't specify how many years ago, but let's just say big hair and leg warmers were a thing. Anne and I were so close that we called each other sister-in-laws, as we were dating brothers at the time. She married hers. I did not. Sadly, we lost touch for some 30 years. 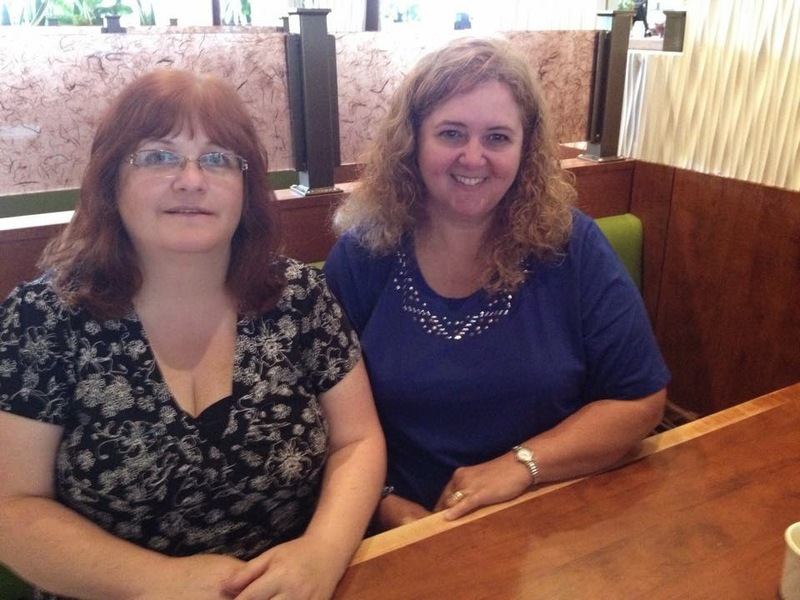 So you can imagine my joy at reconnecting with my long lost friend, a couple of years ago, through social media! Our first get together was at William's Coffee Pub and we caught up for three hours! We were surprised they didn't kick us out! Recently, we decided it was time for another lunch and gab fest, so we went looking for a new venue for our chatting and chewing. 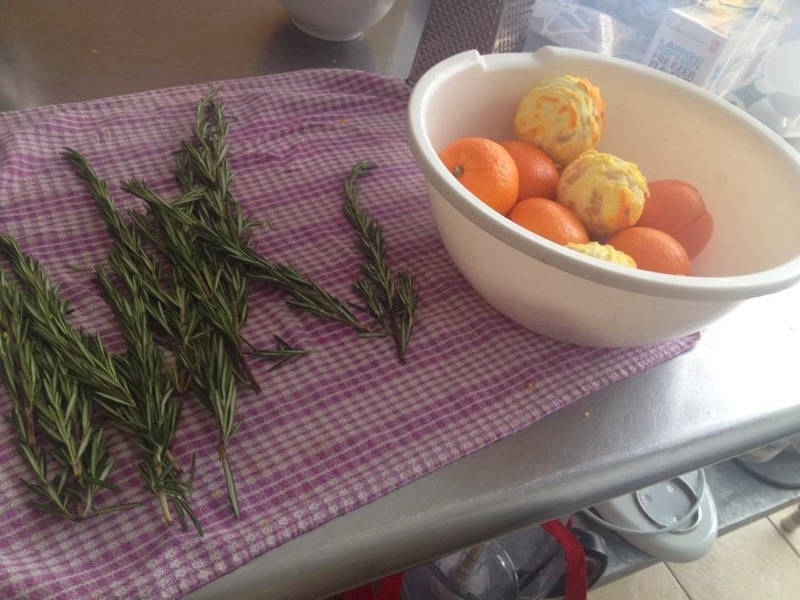 Herb n Sage had been on my mind recently, having been recommended by an acquaintance, so we made plans to meet there at 2:00 after my shift was done. That late lunch turned out to be an ideal time. When I arrived first, there was only one occupied table inside the restaurant and they soon departed. 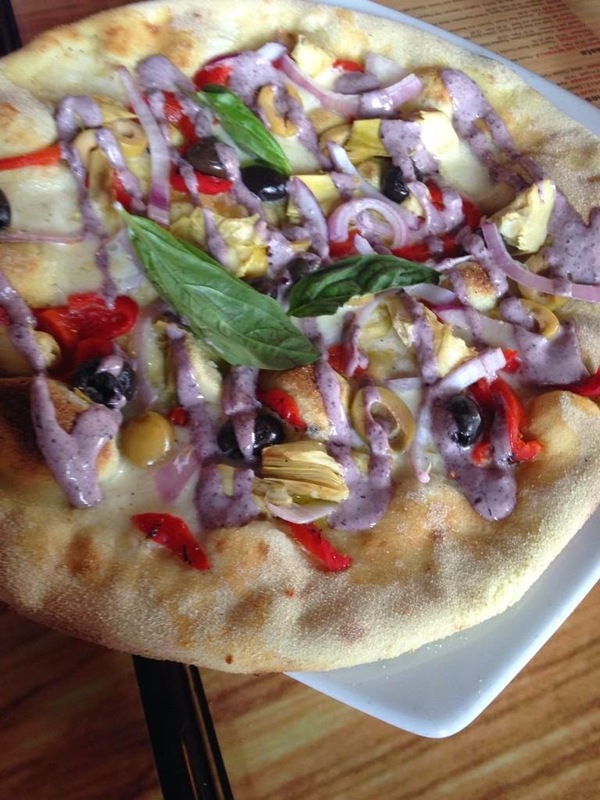 Mid afternoon, between lunch rush and dinner, is perfect for gabby girls who tend towards marathon lunches! Anne arrived perhaps 10 minutes after I did and we had our pick of cozy booths, so we picked one near the back and settled in. A very friendly young server brought us menus and explained the specials. Barrielicious was going on and they offered a back bacon on a bun special with app, drink and dessert for $15. I'm mostly vegetarian (other than fish, eggs and dairy) and Anne doesn't each much meat either, so we passed on that offer. We both ordered caesar salad to start, fish and chips and a tall iced tea. The caesar salad was one of the best I've tasted in a while. It actually had flavour! So many restaurants drizzle on the dressing, while healthier that may be, it doesn't impress me much. I like a caesar that has a bite. That homemade dressing was awesome! Enter the fish and chips. Nice big, crispy pieces on good fries. The two things that stood out were the house cole slaw and the tartar sauce. The tartar sauce? 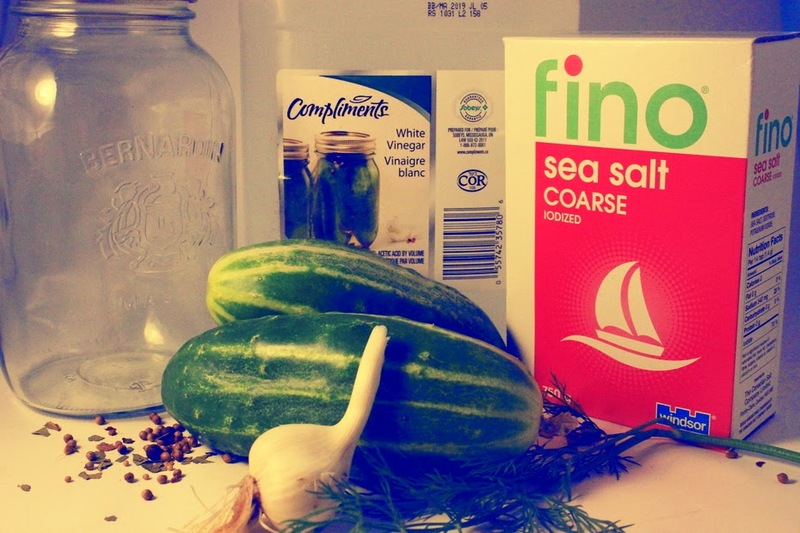 No, you wouldn't expect a tartar sauce to be a stand-out item on it's own, but it wasn't your from-the-jar diner condiment, but lovingly home made and loaded with flavourful dill. A very nice touch. The server returned and offered us dessert, as they always do. And I always politely decline. But Anne was looking interested and once the server said those two magic words that combine so well - cheese cake - I was hooked. There's always room for cheesecake ... and every flavour is a good flavour! I was expecting a slice of something dreamy, but Anne and I got our own little personal pan cheesecakes in a round dish, fluffy whipped cream piped around the edges. Anne got cherry. I got mixed summer berry. I don't know what I was anticipating, but it was not the collection of fresh fruit I received. 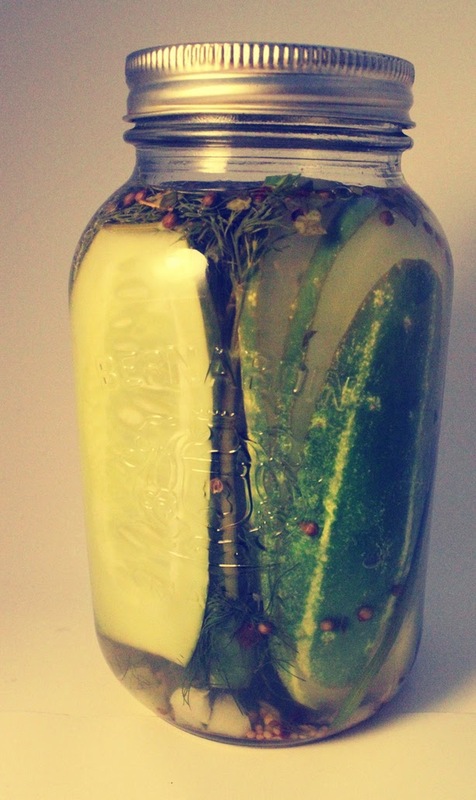 Not canned, not frozen, but straight from the field good. Heaven in a bowl! How did we eat so much??? I suppose when you drag a meal out for two or three hours in an otherwise empty eatery, it's possible. We felt a little guilty but the meal was absolutely delicious and the company so good, who could blame us? I asked our server if all of this is house made food. Yes, all but the desserts, she replied. Obviously, they have chosen a fabulous dessert supplier then. I wonder who it is? As two technologically challenged diners struggled to take a selfie or two (don't laugh), our ever helpful server came by and we asked her if she would help us out - end our suffering, really! She snapped a couple of great pics for us. Thank you, young server. I didn't get your name, but you were wonderful. Herb n Sage is wonderful too. 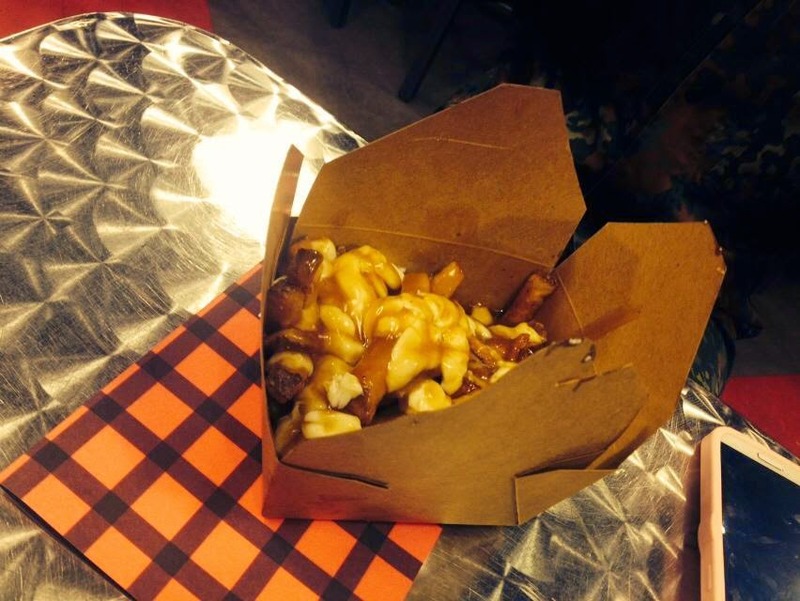 *First published at http://www.sogoodblog.com/2014/05/20/poutine-a-canadian-favorite/ on May 20, 2014 as a guest blog. Who doesn't love a food show? For me, it brings back great memories of sampling my way through the food building at the Canadian National Exhibition when I was a kid. I'm fairly certain I first tasted oka cheese there. Perhaps I've always been a foodie. 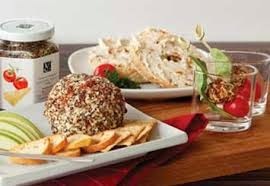 The Savour The Flavours Show held this past weekend at Tangle Creek Golf & Country Club was the perfect event for a curious nibbler like me. Tangle Creek is a lovely setting. I had been there once before for an outdoor wedding a few years ago. It was nice in itself to take a short drive just beyond Barrie's westernmost border into the countryside on a sunny spring day. The show was held inside the clubhouse, which isn't massive, but has a cottagey but modern feel to it, and is situated on a hill with a fantastic bird's eye view of golfers and farmers for miles around. Techno music pumped from the Smokinstein food truck setting up just outside the front doors. I didn't see any obvious signage proclaiming that a food show was inside, but the food truck and the multitude of vendor vehicles in the parking lot was a dead give-away. Inside, I was greeted by a very friendly young woman at the pass desk. I felt like a genuine V.I.P. when she looked my name up on 'the list' and handed me my swag bag. I could really get used to this! Mary Macleod's Shortbread booth was my first stop. It's not that I have a big sweet tooth, (I really don't), but anything Scottish related stops me in my tracks every time. Scotland is my birthplace and also the location of a very old inn where I did part of my cook apprenticeship many years ago. So I stopped at Mary's and a well spoken grand daughter, possibly a great grand daughter, gave me a sample of their chocolate shortbread, and explained how their business got started. The verdict: melts in your mouth! I took a look at various vendors, but some more than others grabbed my attention, so I would stop for a chat. I tarried at SeriTeas because I'm a tea drinker ... or so I thought. Apparently, I don't know as much as I thought I did about brewing teas. No wonder I don't like green tea, (too bitter in my past experience), as it seems the boiled water must cool a few degrees before steeping the leaves. Oh. Cottage Country Vegan; ah what can I say about Carolyn Allgeier? What a lovely soul, full of knowledge and warmth, passion and dedication. At least that's what I took away from our short interaction at her booth. Being a quasi vegetarian myself, or a vegan with training wheels as she so smartly put it, I was a sponge for those few minutes soaking up the information she offered. Some day, I must sign up for one of her all day culinary classes held in the kitchen of her house on Georgian Bay. Hello, kilted gentleman! I'm so glad that no one walked into my back as I stopped dead in my tracks at the booth belonging to the aptly named Highlander Brew Co. 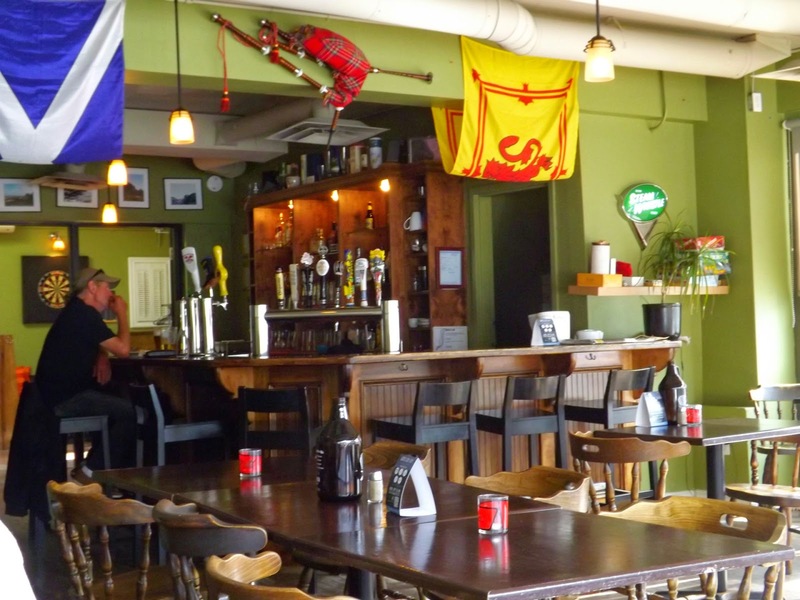 Very soon, I knew that the kiltie was a Wilson of Glasgow descent, the tartan he was wearing was the Canada tartan, and that Highlander Brew Co. produces several varieties out of their South River, Ontario brewery. I'm going to check the LCBO this summer for these inspired names: Blacksmith Smoked Porter, Scottish Ale and Twisted Spruce. No, I did not buy a sample ticket. Some of us Scots are as notoriously frugal as they say! Harvest Share Food box caught my eye too. Based out of the Holland Marsh, where I grew up, the Verkaik family has been farming in the south end of the marsh for 80 years. They have branched out from simple market gardening to selling seasonal produce in boxes that customers sign up for in advance. The contents vary as the growing years evolves. We had a great gab about everything from heirloom carrots to mutual Holland Marsh friends and family. During my childhood playing in those swampy woods, I had only noticed in passing the dark growths of fungus on birch trees and never thought of it again. At Annanda Chaga's informative booth, I received a mini education on the healing properties, long known to aboriginal people, of the chaga mushroom. The black chaga, relative to shiitaki mushrooms, forms over injuries to the tree and forms a 'bandage'. It saves the tree, yet lives from the tree. I sampled a mild tea that is known to detox, de-stress, fight disease and add vitamins. Suprsingly, especially to me, my most memorable and moving conversation of the day was perhaps with Steve Benson of The Restaurant Store of Barrie. Food service supplies don't exactly jump out and grab me. I work with them every day. But Steve was very warm and friendly, a born salesman of course. He told me about their free knife sharpening service, among other things, and told me that they happily accept donations for the Seasons Centre for Grieving Children at any time too. Steve explained that this charity is near to his heart ever since a fellow motorcycle enthusiastic who was suffering from pancreatic cancer once said to him "Yes, my children already go there." In the end, I left with a supply catalogue and goosebumps on my arms. 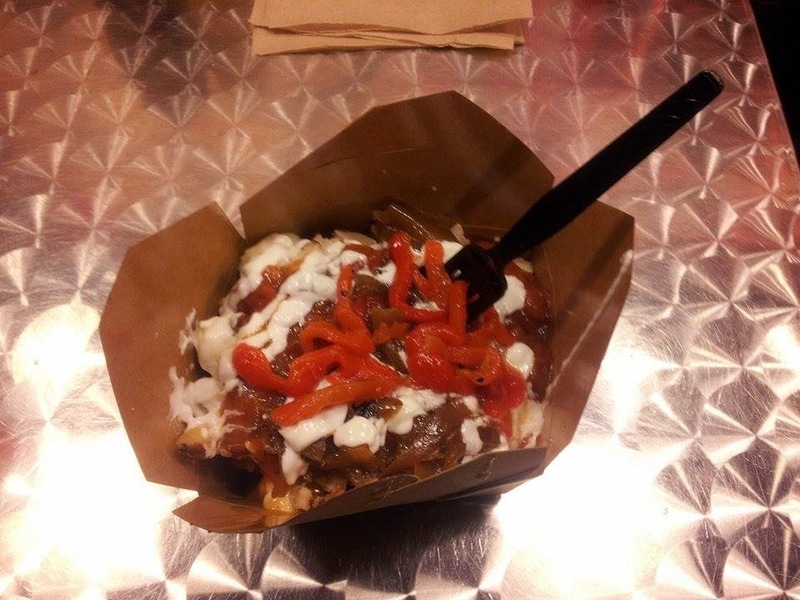 When I left the food show, I found that I had eaten a lot less than I had imagined. It wasn't for the lack of yummy samples - there were plenty! Somehow I exited feeling filled up anyway. The tasty tidbits are a great draw of course, but I found that the interesting people were the biggest treat of all. My middle son, Patrick, is an almost 20 year old, 6 foot 2 inch sports nut with a big appetite and a particular penchant for a well made hamburger. He spends Monday to Thursday at Humber College in Toronto studying Sports Marketing (naturally!) and arrives back in Barrie for the weekend on the first GO train. Patrick brings with him his laptop, four days worth of laundry and an immediate need to eat something! The big fella always says he is good with any eatery that I choose, with the exception of Indian or vegetarian fare, which is partly a joke because he knows those are two of my favourite cuisines. Brat. I had been hearing good things about the Kenzington Burger Bar for some time. The name always came up in discussions about what might be Barrie's best burger. A few months ago, a couple of my high school friends and I were looking for a casual place to grab a bite down town before we saw The Spoons and Saga at the nearby Sound Empire. We settled on Kenzington at 40 Dunlop St. E.. It certainly impressed us girls, but would it score high in the standings with Patrick, the ultimate burger fan? Patrick takes his hamburgers very seriously. He is a master of the 'cue at home, and is currently longing for our patio to reappear from under the winter snow so that he can produce some fine grilled meats once again. He has been a world burger seeker on his travels so far, with good finds in the U.S., passable in France and non existent in Scotland! 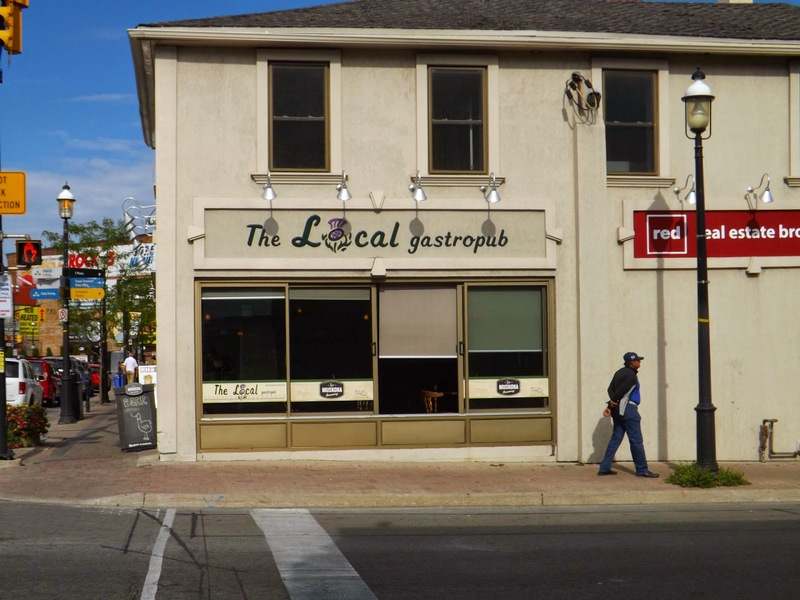 When he arrived at the Allandale Waterfront station a few weeks ago, I asked him if he wanted to try what might very well be Barrie's best burger. As you can imagine, he was all for it. 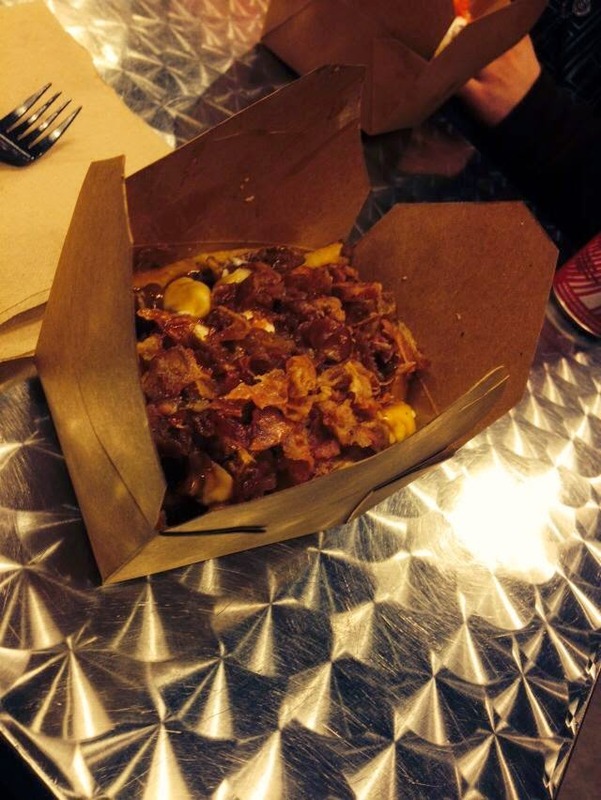 Our first visit, burger aficionado and food blogger, was on a snowy night. We sat at one of the tall tables in the front window and watched the winter weary citizens of Barrie pass by. 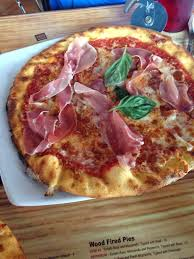 The menu is not complicated, but does have a formula that might require a bit of explaining on the first visit. We both chose the brioche bun, which is not yet printed on the menu, as our bread. The brioche is light, airy and as I call it 'squishable', a necessity when the burger is bigger than my mouth. There are 5 choices of meat. You can bet the farm that Patrick will order prime rib beef and I am a fan of the black bean veggie patty. 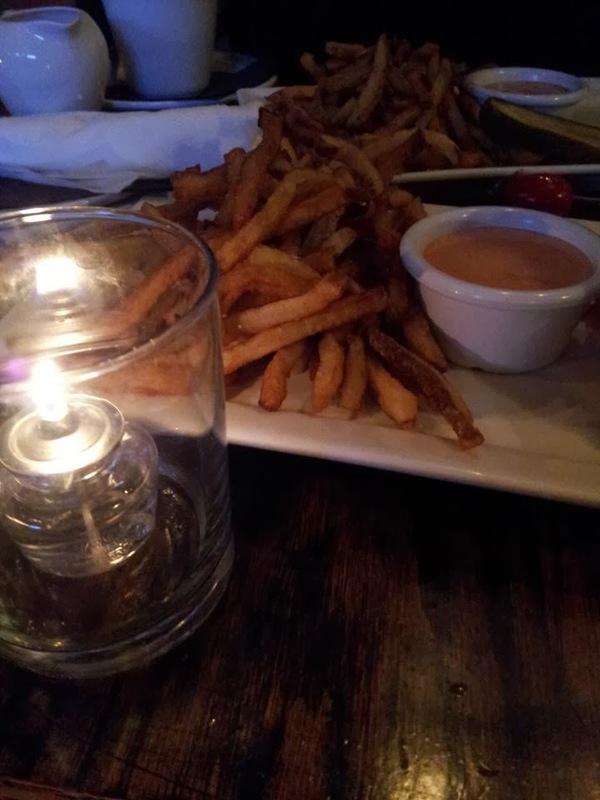 You have 7 options for a side dish, and so far we have yet to stray from the delightful home sliced yukon fries. 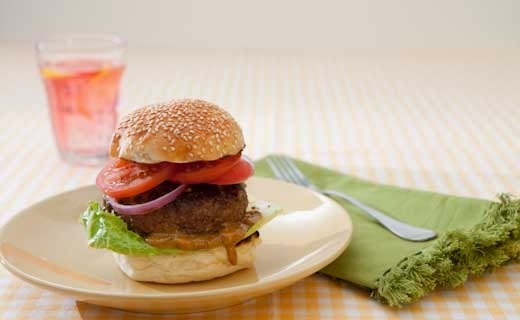 All burgers come with lettuce, tomato and onion, but the fun part is selecting your burger style. By that, I mean you choose from a list of funky names such as the porky, the black & blue or the dunlop, with each moniker describing a set list of eclectic ingredients. On my first visit, with the girls, I chose the dunlop which includes roasted red pepper, spinach and goat cheese. I found the goat cheese to be overpowering. But if you love goat cheese, you will be beyond thrilled. My next time out, and actually ever since, I moved on to the burger style called prime, which I find absolutely magnificent. Prime is a gorgeous layering of grainy mustard, brie cheese, chipotle mayo and crunchy little fried onion strings. I cannot seem to pry myself out of my prime rut. I'm not saying this is a bad thing. My burger loving son has been more adventurous. If memory serves me correctly, I believe he has worked his way through the cowboy, rodeo, porky and most recently the kenzie in our 4 or 5 visits to Kenzington. The kenzie includes a fried egg, something new for Patrick, but he liked it so I expect to be buying more eggs when barbecue season returns to our back yard. On our first visit together, Patrick and I were puzzled and delighted by the small ramekin of zesty sauce that came with our yukon fries. It was delicious, creamy, reminiscent of all dressed potato chips but completely unidentifiable to either of us. When our server returned, we inquired. "What is this wonderful sauce? We just can't figure it out." We did feel a little silly when he told us that it was a house made specialty - ketchup and mayo. Oh. If you've ever seen the comedy film, 'Stepbrothers', you'll know that this same condiment is fought over by 2 idiots who refer to it as 'fancy sauce'. The service is great at Kenzington's too. We are always treated like friends, shown to the nicest available table and served with both professionalism and humour. Somehow the Kenzington Burger Bar has managed to create a unique vibe, a comfortable place that is both bar and restaurant, both casual and upscale. I'm fairly sure that you could easily bring any friend, guest or family member of any age to Kenzington and have a very nice time. The place was hopping the Friday night my girls and I popped in, and we did wait maybe 10 minutes for a table, but Thursdays are more laid back, always a place to sit to warm up and fill up. As for filling up, you know I have never yet managed to finish my dinner at Kenzingtons! No matter what or when I eat earlier in the day, I just cannot do it. I mentioned that fact to my server last week. He pointed to Patrick, who was happily downing my left overs, and said "Well, that's why you bring that guy, isn't it?" Granola never appeared once on any shopping list I ever made. Not ever. Why would it? Nobody in my household, including me, was interested in clumps of dusty, overly sweet bits of uninteresting mystery nuts and fruits glued together with some sort of sugar syrup. I had the vague idea that it was supposed to be good for you, but it certainly didn't look all that good. I certainly had better things to spend my money on than something fairly unappealing that was destined to sit in the back of the pantry untouched for months. The closest I ever came to being a granola fan was back in the 1980s when I was living in the UK and I had a brief love affair with the packaged breakfast muesli called Alpen. Even that product lost its appeal to me, either over time or by adjustment to ingredients for North American tastes. 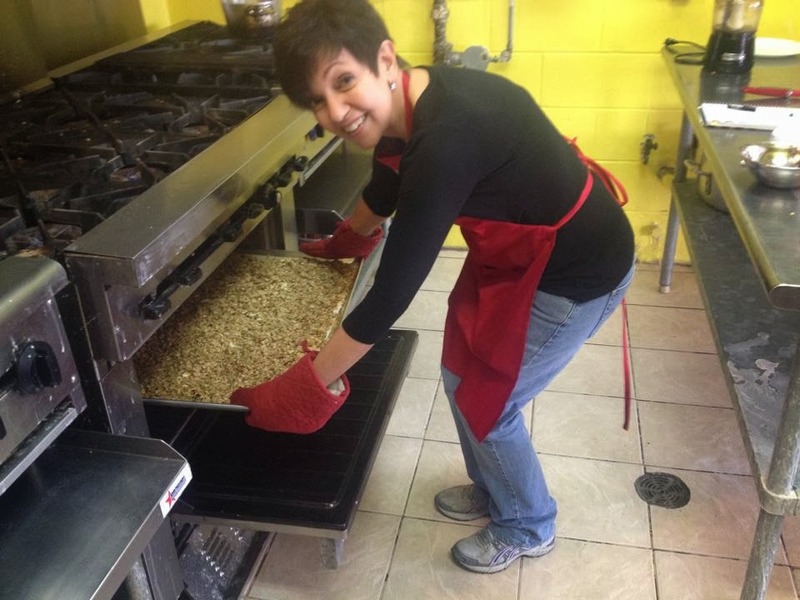 I was excited to be asked by Fran Kruse, co-owner of Not Yer Granny's Granola, to come and observe her while she and her husband/business partner, Mark, made a batch of their product, but I admittedly was not over the top excited about the product. I still had my long held notions about granola. I can tell you, in all honesty, I was completely transformed and converted by the first delicious mouthful I took. No word of a lie - I went from yawn to wow in under five seconds! The first one was called Maple Me Happy. As Fran said, how can you eat something with a name like that and still be grumpy? I was hesitant. Long years ago, as a somewhat greedy child, I once overindulged in a tall stack of pancakes and never could face them nor the taste of maple syrup again, but in the name of foodie science, I ventured forth. Surprise, no in your face maple taste! How can this be, I wondered. Fran explained that it is the fake so called pancake syrup that is so sickly sweet and overly mapley (if that is even a word). How can I describe that first taste I took? Pleasantly surprising, that much is for sure. Nice toasty, loose seeds and oats, mixed with big pieces of real walnut and the most flavourful cranberries and cherries that literally burst out with flavour. My teen son tried his sample too, first out of politeness I think, but then kept going and eventually gobbled up all our combined sample packs on the car ride home! Why is Fran and Mark's granola so good? Firstly, they don't aim to be a granola maker, they aim to be the granola maker. 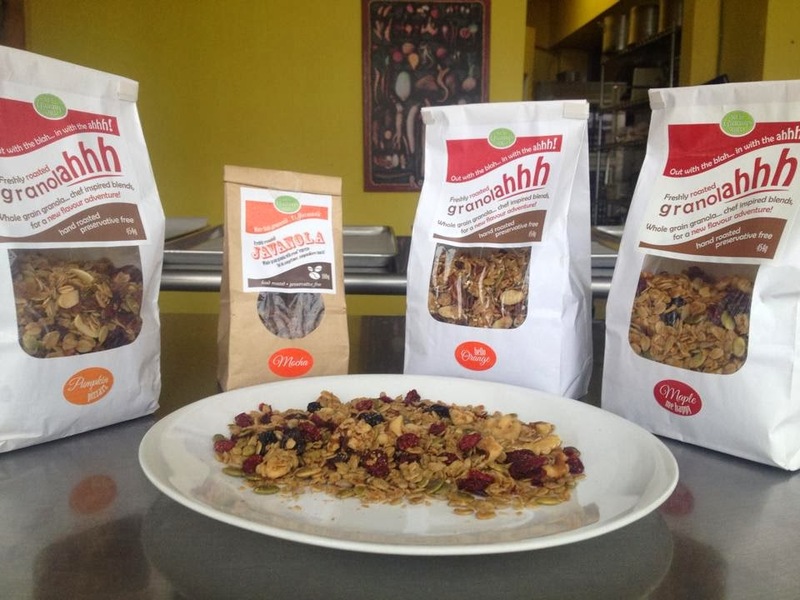 They aim to make a stand out product and have their granola be the very best. They have been researching and testing for a good year now and launched Not Yer Granny's Granola in August. The discerning buyers at the Mariposa Market and Nicholyn Farms, to name just a few, have welcomed their product onto their shelves. And why wouldn't they? The Kruses start with carefully sourced, fresh, natural ingredients, mix and toast it all by hand, and add no preservatives. It is as genuinely home made a product as you could buy. If you haven't figured it out already, Not Yer Granny's Granola isn't just delicious, it's definitely good for you! Of course you can have it for breakfast, and of course it makes a great substitute for trail mix, but as a topping for yoghurt and fresh fruits, (add a scoop of peanut butter as Fran likes to), you have a much better mid afternoon work snack than a doughnut or chocolate bar. 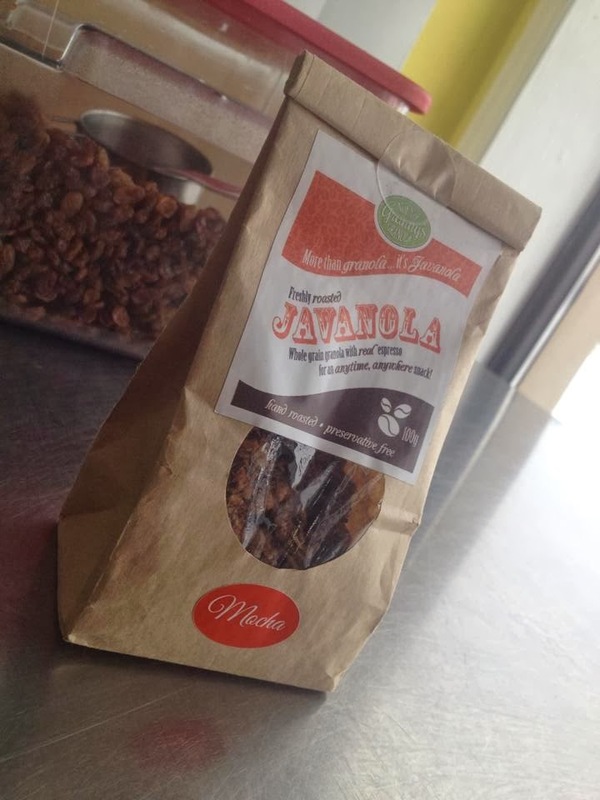 For just such an occasion, the Kruses have also created a new snack item, Javanola, containing a nice mix of cocoa, dark chocolate and espresso to pick you right up. Local nutritionist, Katherine Parent, of Make Good Choices Holistic Nutrition Counselling, makes Not Yer Granny's Granola available in her office. So why is Not Yer Granny's Granola not your granny's granola? Fran is trying to shake our preconceived notions that all granola is dry, tasteless hippy dippy food. She goes a step farther by referring to her product as granolahhh on her packing. You start off thinking blah and quickly move to ahhh. I certainly did. Want to sample the goodies like a foodie? Next weekend, January 11th and 12th, head over to the 5th Annual Women's Show being held at Bradford Greenhouses at 4346 County Rd. 90, just west of Barrie. Fran will be handing out lots of free samples. If you are not an instant convert like me, I want to hear about it. I would be quite shocked. Fran gave me a full sized bag of her Pumpkin Pizzazz granola as we were leaving. Unlike other bags of granola that never made it into my cupboards because I never bought them, this bag never made it because the family went a little crazy over the stuff when I brought it home. Most were on-the-spot converts too, with the "I won't like this." attitude very quickly falling by the wayside. In truth, we probably still don't care for most granolas, but we certainly enjoy this one! My ever dramatic teenage daughter, one arm stuck into the bag, was heard saying "This stuff is so good, I could cry!"